Graham Wallace's 120-day business review provides a snapshot of Rangers' potential future. The challenge for the chief executive and his fellow directors is guiding the club to that point. There is detail in the document, certainly, and some commitments to act in the months ahead. How supporters react will determine the extent of the difficulties that Wallace will face, however, which means that trust is as much of a critical commodity as finance. Both have been in short supply in recent months. The review is a mixture of regret and hope. The amount of money that was squandered after the launch of Rangers International Football Club on the Alternative Investment Market is startling and blame is placed firmly on previous executives - and, by extension, the directors who oversaw them. That analysis is accurate but does not additionally take into account the fact that the appointments of previous and current directors were all sanctioned by the same group of aligned shareholders. Rangers' power structure is ultimately gathered around those shareholders who granted their voting proxies to Sandy Easdale, himself the holder of a smaller shareholding, ahead of the annual meeting in December. It is only change at shareholder level that will alter the power structure. Wallace arrived as an independent figure, but he is now inextricably linked with events at Ibrox. His credibility as chief executive relied, to some extent at least, on the contents of the review but also now on his ability to deliver it, the accuracy of its contents and his judgement in recent months. The latter is already in question following revelations that the club were informed in January, several weeks before any talk was raised of a season ticket boycott, that accepting credit card payments would require security being granted. This was because of the accounts and Wallace's suggestion that the playing staff might accept a pay cut, rather than any fan initiative, yet the review - which was delivered to the stock exchange - states otherwise. With season ticket renewals "slow", according to Easdale - and believed to be significantly lower than at this stage last year - it would seem Rangers fans were waiting to be convinced by Wallace. It did not help, for instance, that he said at the AGM that there was enough cash in the bank to sustain the business until the end of the season, only for the board to then seek a £1.5m loan from Easdale and George Letham - who offered better terms than those initially offered by the single largest shareholder, Laxey Partners - in February. It was also a crass juxtaposition for Wallace, following the release of the review, to fail to deny the bonus arrangements in his contract while at the same time revealing that there would be a "small number" of redundancies amongst the non-playing staff. This followed the appointment of Paul Tyrrell, the former director of communications at Manchester City, Liverpool and Everton, in a consultancy role in the immediate run-up to the publication of the review. Wallace has, at times, seemed unable to negotiate the political intricacies of his position. It would have exasperated him, for instance that, the day before the review launch, Easdale gave an interview in which he described the club as being in a "fragile" position and suggested it would not survive an insolvency event. He was revealing information sensitive to the RIFC share price but is not a plc director, in contravention of stock market rules. Wallace insisted that administration was not discussed during the 120-day review, but the message in the review is clear that, if season ticket sales fall substantially, the business will be unable to trade. It seems inconceivable that, if insolvency is a possibility, it hasn't been discussed. The same message is contained in the revelation that Rangers cannot accept credit- or debit-card transactions for season ticket sales because the merchant provider was seeking security, which is likely to reflect a threat of insolvency should season ticket sales fall. This is a consequence of past recklessness, since supporters have lost faith in those running the club. It will only irk them further to read assessments in the review that £2m was spent on stadium wifi, LED displays and jumbo screens that were "non-essential"; that players were signed last summer that executives should have known the club could not afford. 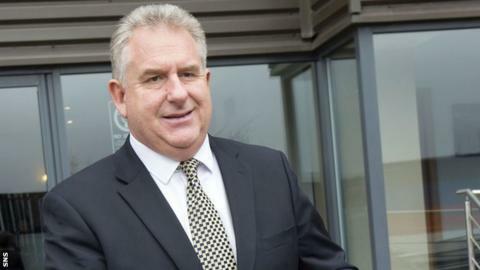 There were promises of optimism, in assertions that manager Ally McCoist will be given funds to spend over future transfer windows in a "more structured and planned" signing policy and that a three-year plan has been drawn up to deliver the Scottish Premiership title. Fans will also like the notion of a chief football operations officer, an academy fund and commercial developments. Wallace's position as chief executive will rest on his ability to deliver these, though, as well as persuading the fans to renew their season tickets to such an extent that there is an overall uplift in sales. So what does the future hold? In part, that is dependent on how much money is left and whether or not immediate costs can be met in the meantime. For now, there remain a number of scenarios. Should there be a shortfall in renewals, the intention is to hold a pre-emptive share offer, of up to 43,400,000 shares, to existing stakeholders. This would likely be at a discounted market price - and the share price fell by 15% to 22p following the review - and so would only raise up to around £9.5m. There is a further intention to seek the approval of shareholders this autumn for a new rights issue, to raise equity for investment. This would, again, be a pre-emptive offer, allowing current shareholders first refusal on a pro-rata basis to protect the size of their stake, but unsold shares, commonly known as the rump, are normally then offered to non-shareholders. This is where Dave King, the former Ibrox director, could make a move. There are other options for King and he could in theory potentially acquire the right from existing shareholders to take up their allocation from a share issue. As with the Union of Fans, King chose to keep his counsel, following the publication of the review, out of respect to the family of the late Sandy Jardine, the former Rangers defender who died on Thursday. South African-based businessman King now at least has options as he looks to implement his strategy to invest in the club. King has publicly asserted that he wants to invest up to £30m, if needs be, but that would be on the basis that he also gains control of how that investment is utilised. In the end, the review came down to several thousand words, some reflection and some casting forward. It emphasises that Rangers are in a potentially dire financial position and signals the attempts that might be made to address this. Can Wallace deliver? Will supporters buy into it? And what will King do now? The following days will be more revealing than the review itself.